February 2009 - That's My Family! When Aaron asked what I wanted for my birthday from everyone else.. All I wanted was my laundry put away.. (it’s all clean.. but not put away..) and the dishes done..
Thankfully his sister and brother in law came through for us.. They gave us a gift card to The Cheesecake Factory and we couldn’t wait to go. I had planned on taking the baby with us.. but at the last minutes Aaron found someone to watch him.. so we enjoyed a nice dinner just the two of us..
And for desert (the only real important part.. right??) I had a chocolate cake.. because well.. Cheesecake isn’t really my favorite.. but chocolate cake is!! And Aaron had a chocolate mouse cheesecake.. We forgot to take a picture till he was almost done! And baby did awesome at Grandma’s house.. He watched Wheel of Fortune with Grandpa..
Had a bottle.. fussed a little then went to sleep. In fact when we got home he was so sound asleep that we just put him directly in his bed! Thanks Rachel and Kevin for the dinner!!!! We moved the baby to his crib when he was only 4 weeks old. We were both shocked..and scared more than anyone could imagine. We knew it was important to move him to his crib but still worried about doing the right thing and him being safe.. 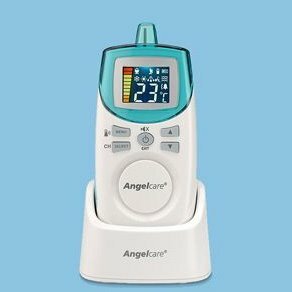 When to the rescue comes the AngelCare monitor!!! This is SERIOUSLY the best investment I have EVER made.. If they weren’t so expensive I would buy one for every one I know. The monitor is amazing.. it has a pad that goes under the mattress and detects movement. 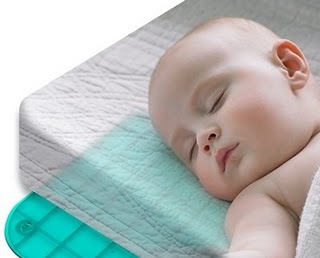 It is sensitive enough to detect every breath the baby makes. 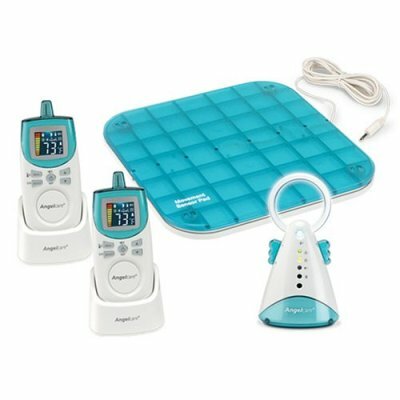 It comes with these awesome monitors that we can hear everything through, but they also tell us the temperature in his room and have a movement que that shows us every movement. then 5 seconds later if no movement is detected yet a louder alarm goes off. I don’t know what we’d ever do without this monitor. We are able to sleep soundly knowing if anything goes wrong we’ll know about it. It has been truly amazing and I recommend it to EVERYONE! I think we’ll even use it when he’s older. Once he’s in a big boy bed it will be nice to know if he ever gets up! The only thing that would make it better would be a video monitor so we could actually see if he’s awake or just whining in his sleep! We’ve never had one scare.. thank goodness! 2 days ago I blew out the candles on my birthday cake 2 days early and wished for 2 things. For you to be healthy, and for you to sleep better. I now believe in birthday wishes. Last night Daddy put you to bed at 7:30, we both woke up around 5:30am and realized you were still asleep. Daddy went in to check on you and you were just fine, but he couldn’t sleep. At about 6:30 he went in feed you. He brought you to me while I was getting ready for work. You were sound asleep in his arms. You looked so peaceful and happy. I kissed you and told you how much I loved you. You only stirred a little. You were too tired and didn’t even want to eat much. You drifted back to sleep, and daddy climbed back into bed. It was harder than ever to leave you two this morning. You are the best birthday present I could have ever hoped for. Daddy really needed that sleep. Thank you! P.s. Will you sleep like that again on a day when I don’t have to be up at 5:30?? 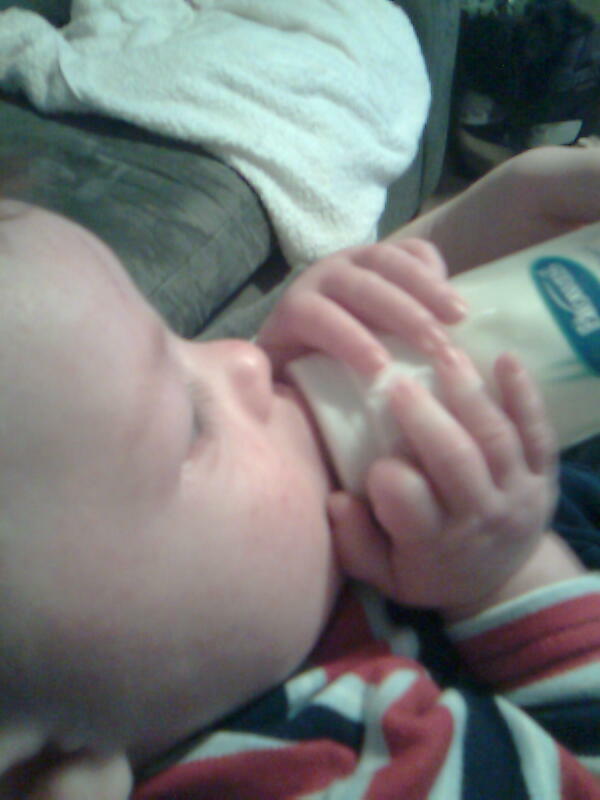 How many 9 week old babies do you know that can hold their own bottle??????????? Daddy has been working very hard on this…..
A nice day for a walk.. I have been wanting to take the baby for a walk outside since the day we came home from the hospital. I guess going for a walk around the neighborhood with your baby in a stroller is one of those quintessential family moments that I always pictured in my head.. It was a balmy 50 degrees out today so I figured now is as good a time as any! 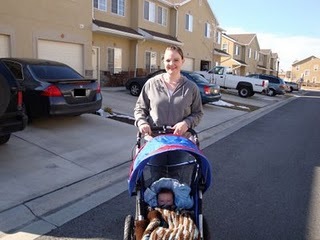 A friend gave us this stroller (brand new!!) and I’ve been dying to use it. Aaron went out to get it all ready and discovered all 3 tires were flat!!!!! But hey.. the baby only weighs 13 pounds.. so we thought we’d still give it a whirl. And after a few photo ops.. we were off…. By the time we reached the end of the street… he was out! I think he really enjoyed his walk.. it’s about time he get some fresh air. At least now I know it’s a way to calm him down and put him to sleep! When we got home we just pulled the stroller into the living room and let him continue sleeping… it wasn’t long before the loud neighbor kids woke him up..